As a fourth generation, family-owned company, Buddig takes special pride in helping you turn everyday moments into new family traditions. 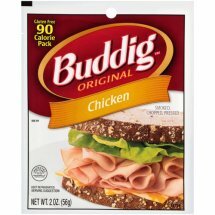 Enjoy Buddig Original Chicken. Mechanically Separated Chicken, Chicken, Chicken Broth, Salt. Less than 2% of: Modified Food Starch, Dextrose, Potassium Lactate, Carrageenan, Sodium Phosphate, Autolyzed Yeast Extract, Sodium Erythorbate, Sodium Diacetate, Natural Flavoring, Sodium Nitrite, Turmeric.